LAKE CONROE – As boaters are expected to hit the lake this summer, law enforcement officials are starting up a new initiative to make sure those boaters are doing so in a safe manner. 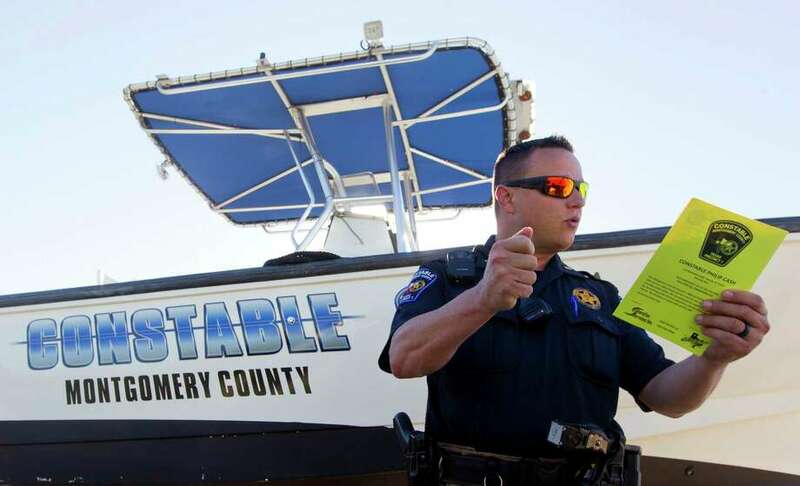 The Montgomery County Precinct 1 Constable’s Office kicked off pre-launch safety checks for boaters a few weekends ago, which officials said will keep lakers safe and help out deputies along the way. The checks were first implemented during the 2017 GEICO Bassmaster Classic on Lake Conroe in March, according to Precinct 1 Constable Philip Cash. As boaters are readying to launch, a Precinct 1 Constable’s deputy or volunteer will check the boat for a flotation device for each passenger, a class IV throwable or ring buoy, a charged and accessible fire extinguisher, and a sound-producing device, such as an air horn. The designated person will also check for the vessel’s registration card and the number of passengers setting off. Once in compliance, that information is jotted down on a brightly colored pamphlet the boater keeps onboard and is able to reference if stopped by a deputy later on the water. If boaters are found to not have any of the required safety items, Cade said it’s better to be checked before launch because they are able to head to a nearby boating supply store and pick up the necessary merchandise. If boaters are found on the water without the necessary items, Cade said deputies are able to write citations – which come with fines just like traffic tickets – for each required safety item that’s missing. However, circumstances can arise where citations are the least of boaters’ problems. There have been a half dozen drownings on Lake Conroe reported by The Courier since summer 2015. Frederick Barksdale, 38, drowned May 17, 2015 while swimming near his boat. Bradley Wiseman, 30, drowned August 15, 2015 after falling off a tube being pulled by a boat. Benjamin Davila, 50, and Nancy Richardson, 68, both drowned on July 25, 2016 in separate incidents. Guymara Leveille, 25, drowned Aug. 20, 2016 after jumping off a pontoon boat. Most recently, Richard Howard, 69, drowned Jan. 30 after falling into the lake at the Lochness Marina RV Park in the 14500 block of Calvary Road west of Willis. All six reported drowning victims were not wearing life jackets. A 2014 Houston Chronicle analysis of deaths on Texas lakes showed Lake Conroe to be the deadliest since 2000 at that point. While Cash said that figure has gone down, he still regrets the fact Lake Conroe has the reputation. Cash said he’s pushing for more education on boating while intoxicated as well, which is treated just like driving while intoxicated. It’s illegal to operate a boat with a blood alcohol content of 0.08 or more, or if the intoxication impairs a boat operator’s mental or physical faculties. BWI is a Class B misdemeanor punishable with up to six months in jail. Again alluding to DWI, Cade said it’s important not only to have a designated driver but also a designated captain of the boat who stays sober and can handle any issues that come up with intoxicated people on the boat. Deputies and volunteers will perform the checks at different marinas on the lake throughout the summer.